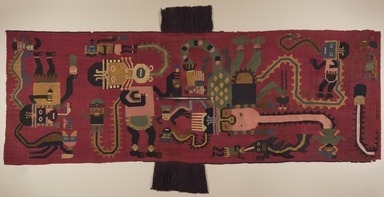 This large panel is the most elaborate example of the discontinuous warp and weft technique in the Museum’s collection. 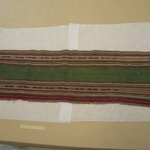 With this technique, the warps and wefts on the textile change with every color and weaving session, rather than being continuous along the length and width of the fabric (see diagram). 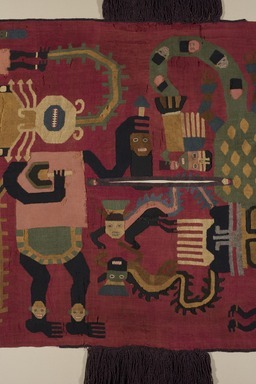 The bold designs on the red background include three large, colorful supernatural beings connected to several smaller figures. 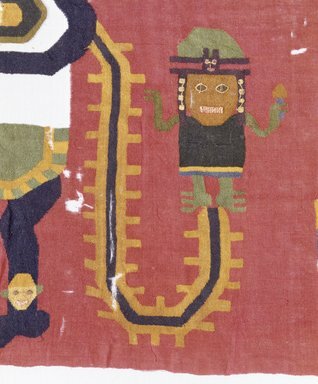 The largest figure wears a green and yellow feline pelt and is associated with two mythological animals devouring humans: an anthropomorphic bird and a shark depicted with a human arm. 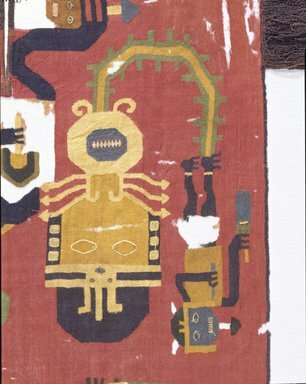 These composite beings combine animals of the natural world with Nasca supernatural deities who keep the world in order. 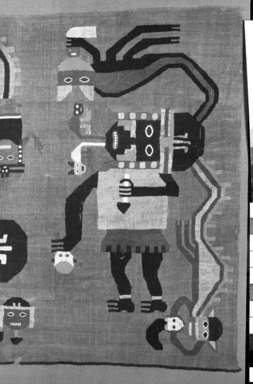 The panel was converted into a poncho in antiquity, when a head opening was made at the center and long tassels were added at the shoulders. 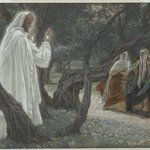 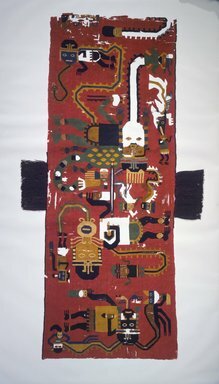 Este gran panel es el ejemplo más elaborado de la técnica discontinua de urdimbre y trama en la colección del museo. 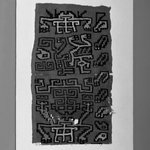 Con esta técnica, las urdimbres y las tramas en el tejido cambian con cada color y en cada jornada de tejido, en lugar de ser continuos a lo largo y ancho de la tela (ver diagrama). 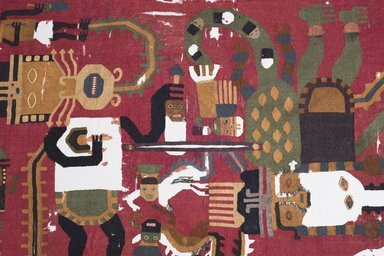 Los audaces diseños sobre el fondo rojo incluyen tres grandes y coloridos seres sobrenaturales conectados con varias figuras más pequeñas. 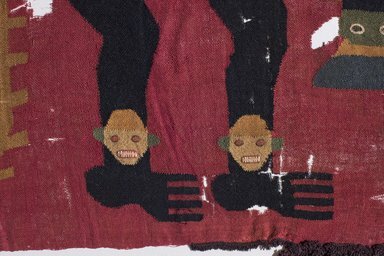 La figura más grande lleva una piel felina amarilla y se asocia con dos animales mitológicos que devoran seres humanos: un pájaro antropomórfico y un tiburón representado con un brazo humano. 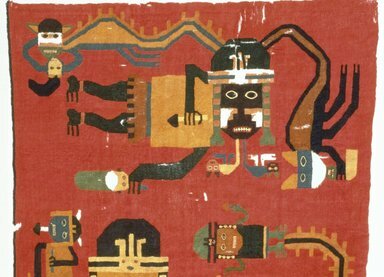 Estos seres compuestos combinan animales del mundo natural con deidades sobrenaturales que mantienen el mundo en orden. 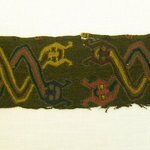 El panel fue convertido en poncho en la antigüedad, cuando se hizo una apertura para la cabeza en el centro, junto a unas borlas que fueron añadidas en los hombros. 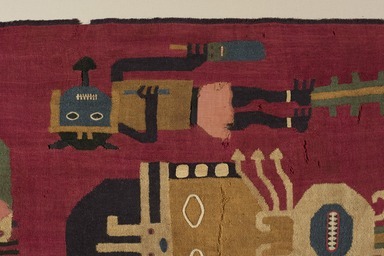 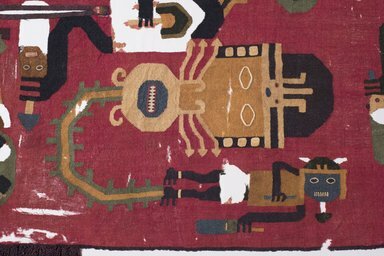 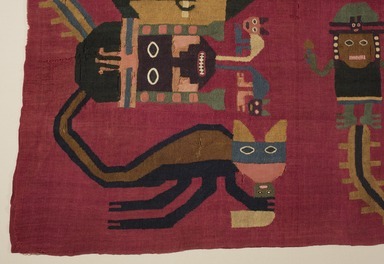 CATALOGUE DESCRIPTION Poncho with three large figures and ten smaller figures on a red background. 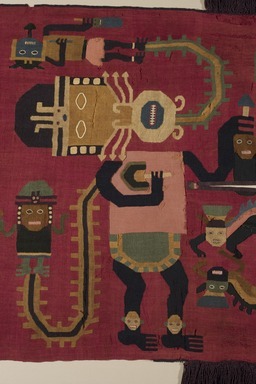 The large figures, each one different, are shown wearing headdresses, masks, ponchos, a skirt and loincloths.They hold trophy heads, knives and arrows in their hands. 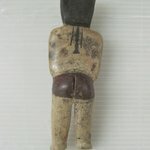 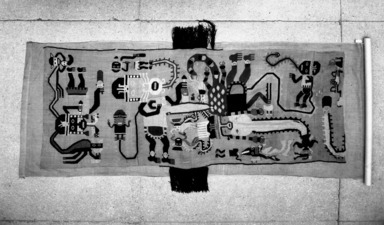 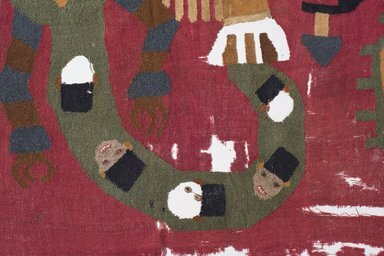 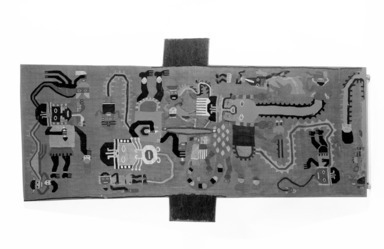 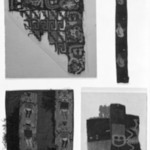 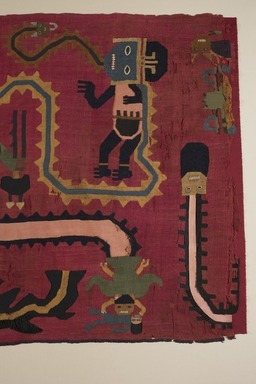 The smaller figures are attached to the ends of serpent or ribbon-like extensions from the belts, headdresses, tails and mouths of the large figures. 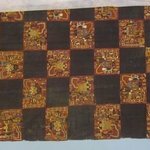 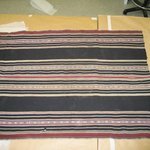 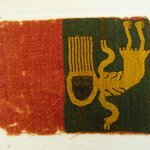 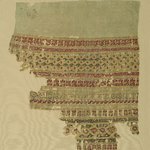 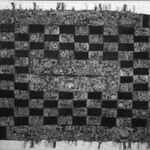 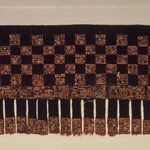 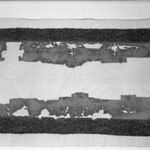 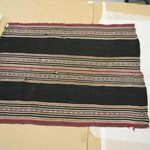 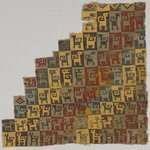 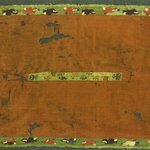 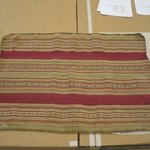 Mary Frame has noted that this textile was made into a poncho in antiquity from part of a larger cloth. 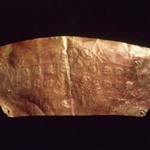 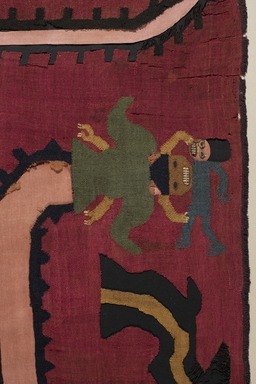 It may originally have been a banner or hanging or half-mantle with a minimum of four figures. 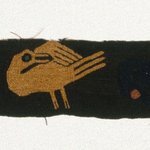 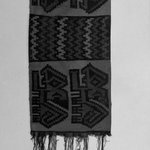 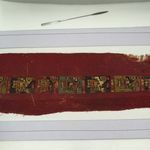 The band around the neck, the fringe, and side trim were embroidered onto the textile after the weaving and are worked in a purplish color not found in the weaving. 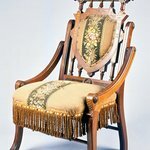 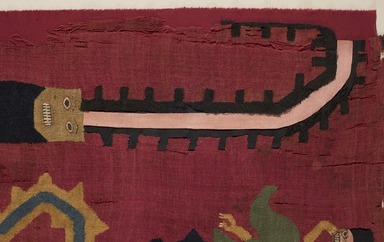 One scholar has suggested that the neck opening was added at some time after the textile was originally woven. 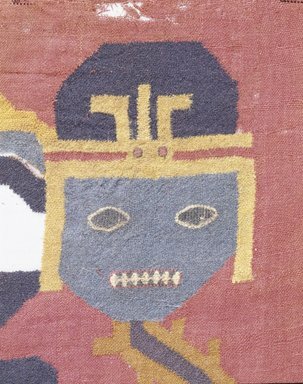 The neck aperture (24 cm) is small for a human head, unless the skull was radically elongated. Some "tunics" with small neck slits were slipped over the false head of a mummy bundle at Paracas Necropolis. 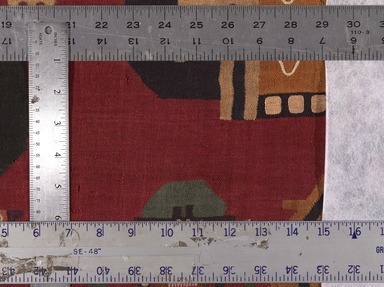 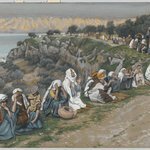 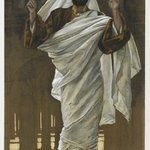 Regarding the figure repetitions, a minimum of four figures [would have] repeated along the original length of cloth. 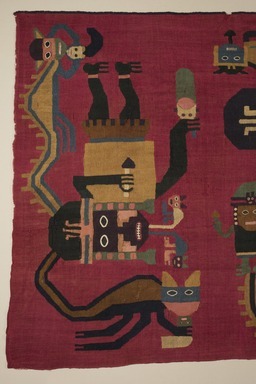 The feet of the major figures face the same direction and the figures alternate in an up-down orientation. 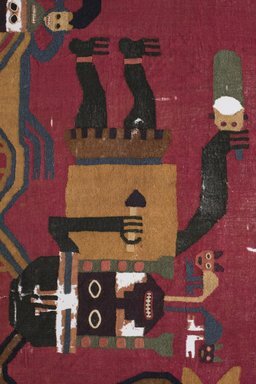 The largest figure on 34.1579 wears a feline-pelt headdress and is associated with two mythological animals devouring humans: a bird man on the end of its chin appendage and a shark with a human arm. 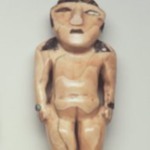 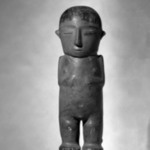 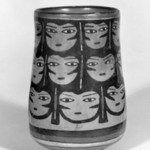 Each figure portrayed is different and alternatively colored, some wear mouth masks and all have head ornaments. 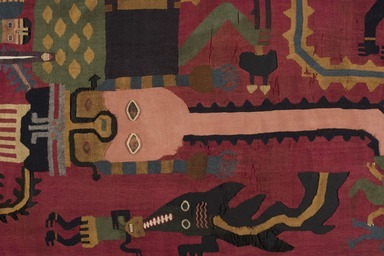 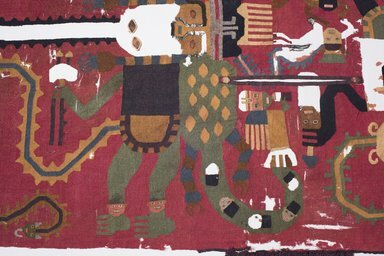 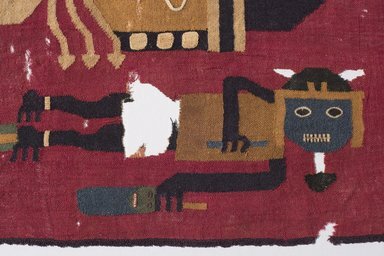 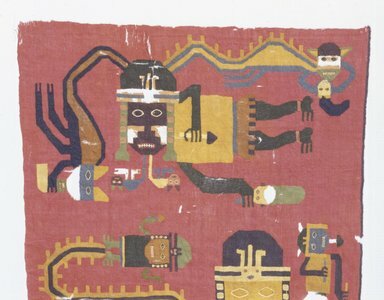 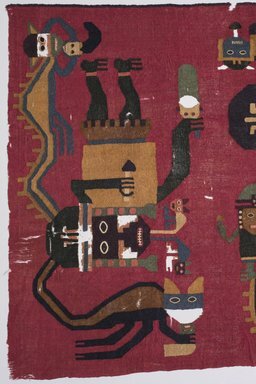 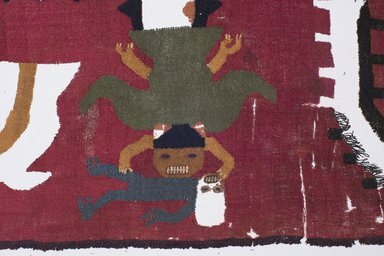 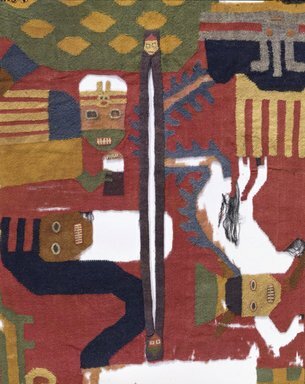 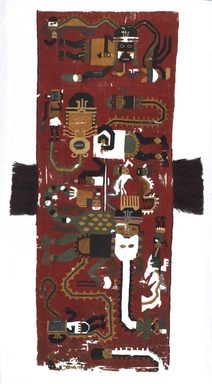 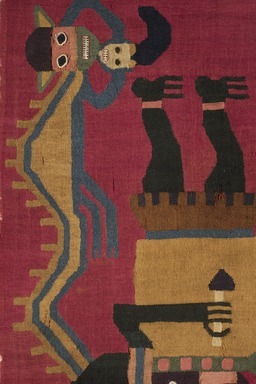 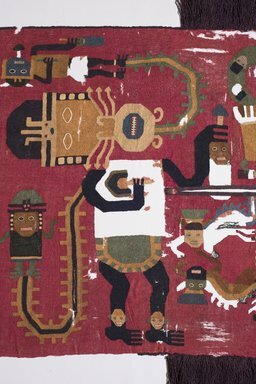 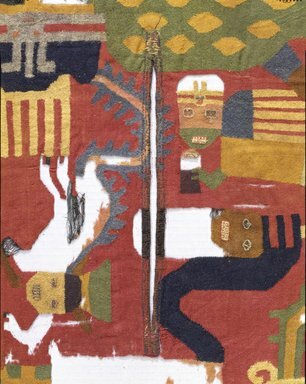 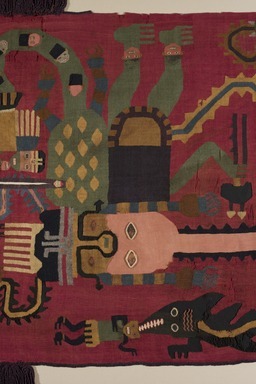 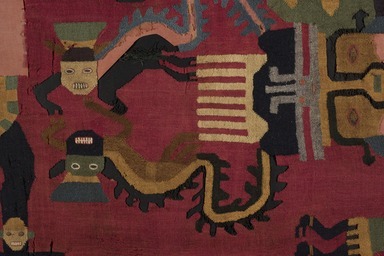 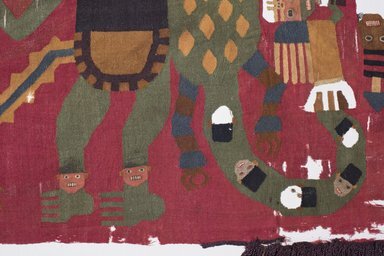 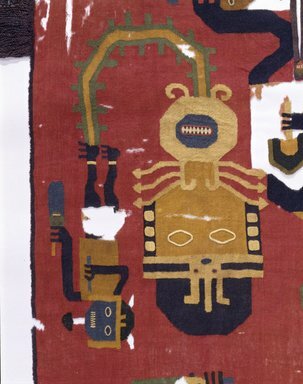 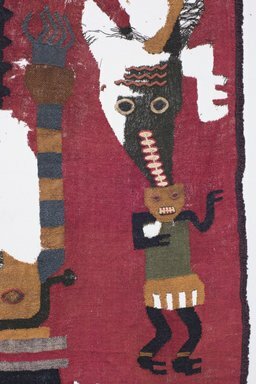 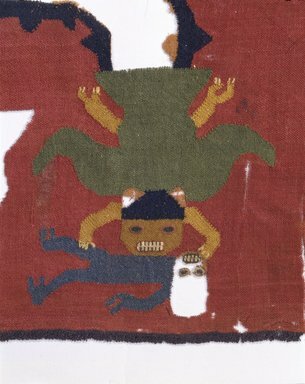 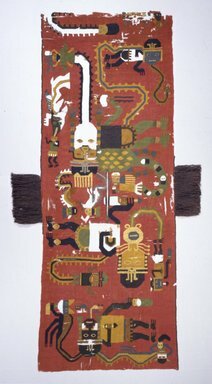 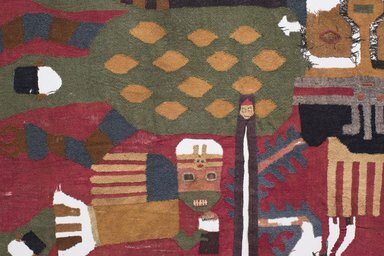 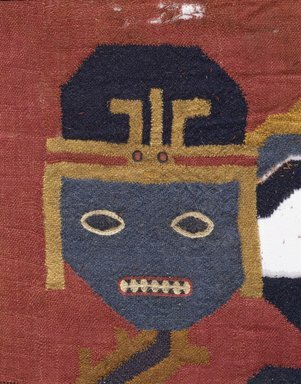 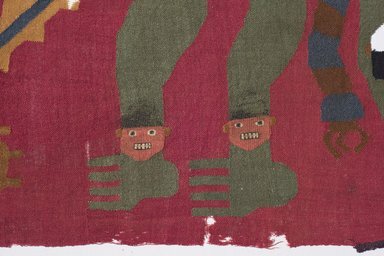 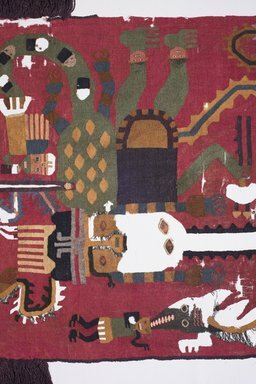 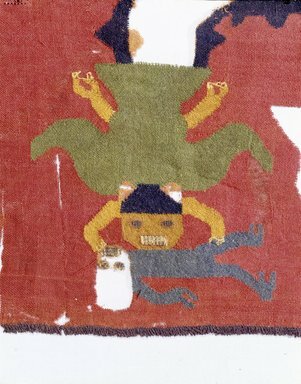 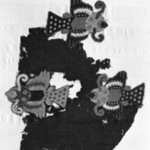 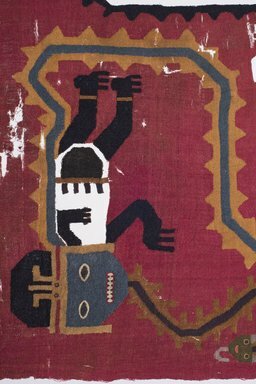 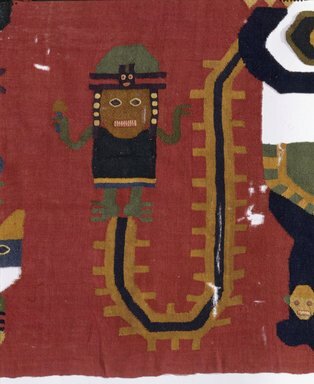 A minor figure on the left side of the tunic is a fishy creature devouring a human, a mythological theme that is recreated on other embroideries. 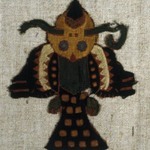 Size: adult; probable wearer: male. 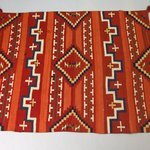 Vertical camelid fiber warp and camelid fiber weft; camelid fiber embroidery. 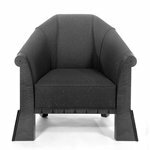 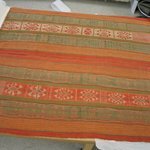 The ground cloth is a scarlet plain weave, warp and weft interlocked. 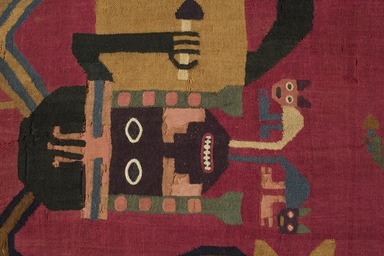 Fourteen additional colors are used in the woven imagery. 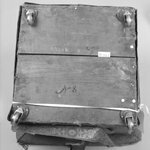 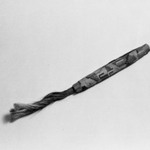 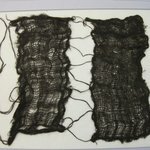 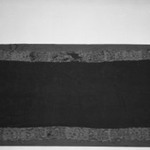 However, the black has deteriorated due to the use of an iron mordant. 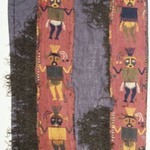 There are single interlock joins, and stem-stitch embroidery is used for the details of the eyes and some of the mouths. 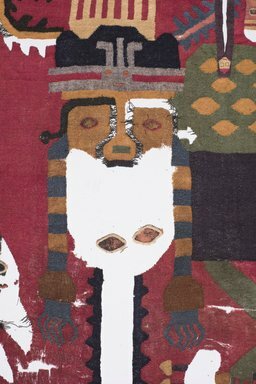 A dark purple fringe is attached at the shoulder area, possibly a later addition. 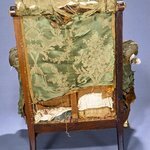 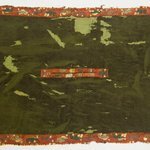 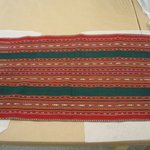 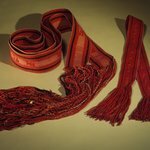 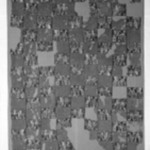 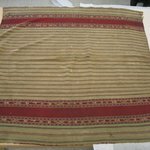 A thread count carried out by Barbara Applebaum of the Brooklyn Museum Conservation Department notes that there are 12 warp and 15 weft yarns per cm.